This tiny (2mm wide) microphone mimics the hearing mechanism of the Ormia ochracea fly. University of Texas Austin researchers had admired the fly's ability to pinpoint the location of crickets; this is another excellent example of how biomimicry can aid engineers. The parasitoid fly Ormia ochracea has the remarkable ability to locate crickets using audible sound. This ability is, in fact, remarkable as the fly’s hearing mechanism spans only 1.5 mm which is 50× smaller than the wavelength of sound emitted by the cricket. The hearing mechanism is, for all practical purposes, a point in space with no significant interaural time or level differences to draw from. It has been discovered that evolution has empowered the fly with a hearing mechanism that utilizes multiple vibration modes to amplify interaural time and level differences. Here, we present a fully integrated, man-made mimic of the Ormia’s hearing mechanism capable of replicating the remarkable sound localization ability of the special fly. 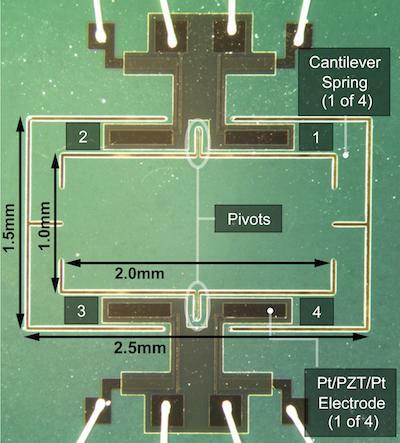 A silicon-micromachined prototype is presented which uses multiple piezoelectric sensing ports to simultaneously transduce two orthogonal vibration modes of the sensing structure, thereby enabling simultaneous measurement of sound pressure and pressure gradient. There it studied its surroundings, transmitting to its manipulator, far away now, all that it heard through its ear microphones and saw with its minute vision tubes. If you found this interesting, be sure to read the full description in the article at Sound source localization inspired by the ears of the Ormia ochracea or the material in the article at KurzweilAI.